VATICAN CITY (CNS) — The seven new saints of the church were holy not because of their own efforts but because of “the Lord who triumphs in them and with them,” Pope Francis said. 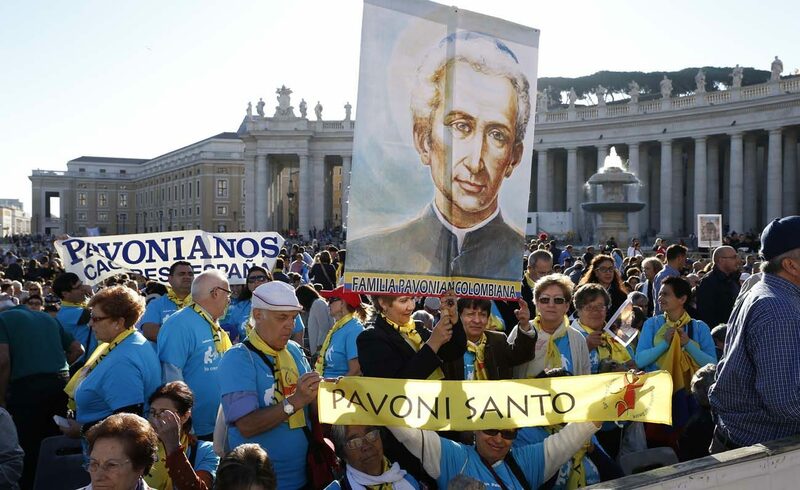 Each one “struggled to the very end with all their strength,” which they received through perseverance and prayer, the pope said Oct. 16 at a canonization Mass in St. Peter’s Square. “They remained firm in faith, with a generous and steadfast heart. Through their example and their intercession, may God also enable us to be men and women of prayer,” the pope told the estimated 80,000 people present at the Mass. Seven large tapestries bearing the portraits of the new saints decorated the facade of St. Peter’s Basilica, some representing specific aspects of their lives that exemplified their holiness. Argentine “gaucho priest,” St. Jose Gabriel del Rosario Brochero was portrayed sitting on a donkey, his humble means of transportation when traveling thousands of miles to minister to the poor and the sick. St. Jose Sanchez del Rio, a 14-year-old Mexican boy martyred for refusing to renounce his faith during the Cristero War of the 1920s, was depicted holding a palm branch and rosary while a trail of blood and a single bullet were at his feet. St. Salomone Leclerq, who was killed after refusing to renounce his faith at the height of the French Revolution, was shown with his eyes fixed toward heaven as an angel carried a palm, symbolizing his martyrdom for the faith. The French Carmelite writer and mystic, St. Elizabeth of the Holy Trinity, was shown seated in prayer, and St. Manuel Gonzalez Garcia, a Spanish bishop who spent his life devoted to Eucharistic adoration, smiled radiantly. Brightly colored tapestries also featured the images of two new Italian saints: St. Ludovico Pavoni, the founder of the Sons of Mary Immaculate, who dedicated his life to the vocational and spiritual education of the poor and hearing impaired, and St. Alfonso Maria Fusco, founder of the Congregation of the Baptistine Sisters of the Nazarene and of the Little House of Providence, a home for abandoned children. Following the singing of the Litany of the Saints, the pope “declared and defined” their sainthood which was met with applause from crowd, many waving banners and flags in approval. He reflected on the day’s first reading which recalled Moses raising his arms in prayer while the Israelites fought Amalek’s army. When Moses’ arms would fall from weariness, the tide would turn against Israel. Like Moses who grew weary, yet was sustained by Aaron and Hur, Christians must remember they are not alone in the church, the pope said. “We are members of the body of Christ, the church, whose arms are raised day and night to heaven, thanks to the presence of the risen Christ and his Holy Spirit. Only in the church, and thanks to the church’s prayer, are we able to remain steadfast in faith and witness,” he said. Looking at the day’s Gospel reading, the pope said Jesus’ parable of the widow who persists in seeking justice reveals “the mystery of prayer” which involves crying out persistently and not losing heart. “To pray is not to take refuge in an ideal world, nor to escape into a false, selfish sense of calm. On the contrary, to pray is to struggle, but also to let the Holy Spirit pray within us,” the pope said. Before the final blessing, Pope Francis led the faithful in praying the Angelus and thanked the delegations as well as the pilgrims from the various countries of the new saints for their presence. The official delegations included Argentine President Mauricio Macri and cabinet ministers from Spain, France and Italy. The official Mexican delegation was headed by Roberto Herrera Mena, adjunct for religious affairs.